Oh and I think that there are two more little Lady Liberty's there in Paris! Good searching! She's everywhere. 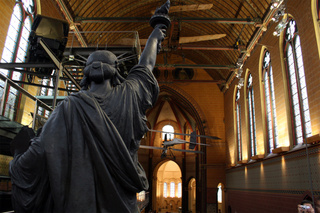 I found a Lady Liberty in the Central Massif town of Saint-Etienne. Identical but smaller and with a light-bulb-like fixture installed on top of the torch! I'll see if I can scan in the photo. It's kind of hilarious. I imagine menage-a-3 wine must have an incredibly wide stance.. Most actual news about 11 9 cover deception media tower up and Wheel cover http://blogprowatches.com/ .